As part of our weekly updates, we’ll be posting Bios of contributing members to the PVIT program, starting this week with John Jenkins. 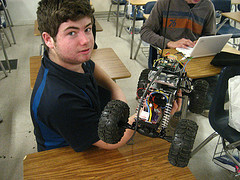 John, a current Junior, has been involved in PVIT for 3 years. Last year, he worked on the Robomagellan team, focusing heavily on the mechanical engineering side of the project. This year, he will be leading a new project, the Autonomous Unmanned Aerial Vehicle (UAV) while still contributing to the Robomagellan project. John is considering majoring in Aerospace Engineering at MIT. Outside of school he enjoys playing golf and is the saxophone section leader in the PVHS Marching Band.